We've had some severe weather in our area over the weekend. I heard on the news today as many as three tornadoes were in the area Sunday. Our tornado sirens were buzzing in our town to take shelter Sunday, but fortunately for us, we did not experience any tornadoes. Many homes, schools and businesses are without power in nearby towns. I feel for them. At least the weather isn't freezing, although very humid. Last week my furnace kicked on a few times in the morning, now we have the central air on. Go figure??? We did lose the Internet until Tuesday, so not much blogging for me. I was able to get some sewing in, though! It's so beautiful outside that I thought I would take some photos in my flower garden. I LOVE how it turned out!!!! I used Wild Rose charm squares by Blackbird Designs. I've had these charm packs for a while now. I purchased them for a different Schnibbles pattern, but then changed my mind. I wanted to wait for the perfect pattern. I'm so glad I did!! The background fabric is Primitive Muslins, Tallow by Primitive Gatherings for Moda. Have you tried Primitive Gatherings line of Primitive Muslins yet?? They are awesome!!! They are so soft, unlike many aged muslins that can feel a little stiff. They come in 5 different shades. I used the lightest of the 5. I had quite the little photo shoot!! I chose to quilt my favorite...feathers. A nice allover meandering feather I think was a great choice for this project. I used another favorite...wool for the batting. 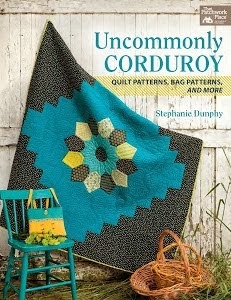 I love how wonderful wool makes the quilting look! I had two remnant pieces of wool leftover from other projects that I just put together for this. Worked out great!! I love the back too! I have the binding ready to go on. Hopefully I'll get that sewn on tonight while the girls are at dance tonight! Simply wonderful. The quilt is great. I'm glad you didn't get hit by the bad weather. I really love the quilting! I am only getting to know your blog now, so I do not know if you quilt via domestic machine or longarm. Either way it is awesome! I, too, love wool batting and how the quiling just pops when you use it! Wow!! That turned out fantastic. Your choice of colours and fabric is stunning and your quilting is the icing on the cake!! Well done! It is wonderful but the quilting really makes teh quilt on this one!! Very lovely quilt and quilting once again! I love most every fabric that comes from Blackbird Designs! Love them! I so love Brocante it's such a lovely pattern....the pics look good outside in the garden LOL. Beautiful quilt and quilting, love the colors. A beautiful-looking quilt, and the quilting is equally beautiful. So glad to hear that you were bypassed by those tornados. Living on the west coast, we don't see them here. Just rain and more rain. Sunny today, though. I have never done a schibbles pattern but every one I have seen I love and this is no exception , beautiful and your quilting really looks amazing ! Great photo...it shows your quilting beautifully!! Very pretty...the quilting is wonderful! I'm glad you got missed by the tornados...those sound very scary to me! beautiful! Love the front and the back too! Can't go wrong with feathers!! Isn't it 'great' when we find just the right pattern for the 'right' fabric!!! Love what you did with the quilt--way to go, girl! Brocante looks great & the quilting is beautiful. Gorgeous! I love the fabrics an the quilting! Cute! Cute! Cute! Great fabric combination.....the blackbird designs and aged muslin. Glad your weather settled down some. Oh wow it's beautiful! And the quilting is fabulous! Great job. Bee-oo-tiful. I love the fabrics and the feathers look just great on it. I've never tried 100% wool, but I do like the 80/20. Your quilt is beautiful, and so is your quilting. I love the feathers....and just look at your pretty flowers! I'm so glad you're taking time to quilt for yourself, Linda! The feathers make this La Petite shine! 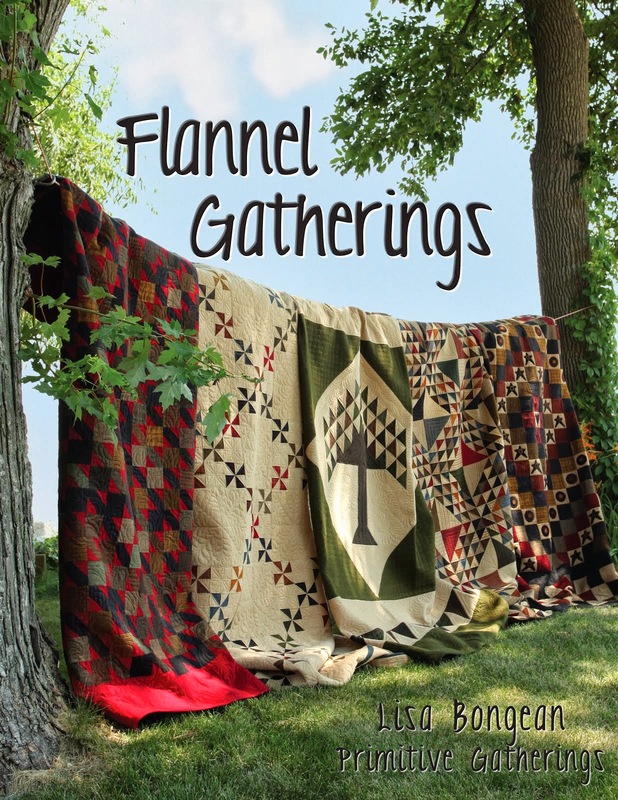 I love Primitive Gatherings muslin and can't wait for the new line to arrive! Love, love, love. Great photos.